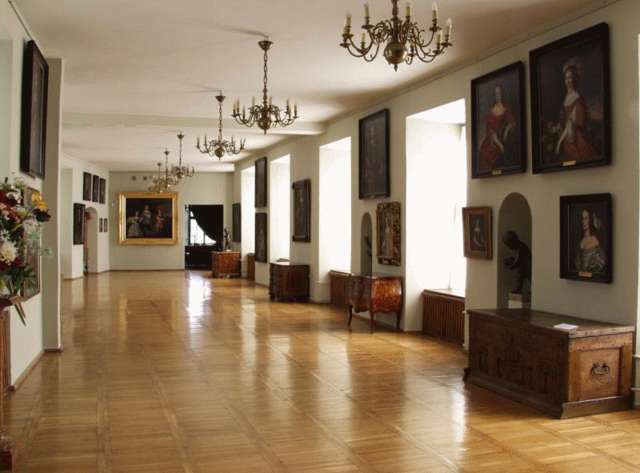 The exhibition presents one of the most valuable collections of the Museum of Warmia and Masuria. The authors of the paintings are leading Dutch portraitists, associated with the Hague court of the van Oranje-Nassau family: the brothers Gerrit and Willem Honthorst, Pieter Nason, Jan Mytens, Caspar Netscher and the lesser known Lucas van Kaey. In addition to signed portraits, the collection also contains great works attributed to other Dutch portraitists, operating under the patronage of the Oranje and the local aristocracy (van Brederode, Nassau-Siegen, Solms-Braunfels), as well as English (the Stuarts), Swedish (Oxenstierna), north German or Prussian aristocracy. The latter are mainly the Dohna, hailing from Morąg, whose political, military or ecclesiastical careers were linked from the beginning of the 17th century with the Netherlands. It was thanks to the Dohna that the collections of Dutch works of art made their way to their family residences in Prussia, and they partially survived until our times. On the one hand, the exhibition is a kind of family gallery, showing genealogical, political, cultural and religious relations of the above families, on the other, it is an example of the popularity of portrait painting as an important element of the Netherlands' culture, which had its "golden age" in the 17th century, both in art and other areas of life. The portraits presented at the exhibition are not only representations of people, but also representations of personified concepts, and ethical and religious ideas. The symbolic content, very popular in 17th century Dutch painting, manifest themselves in such elements of the painting as antiquating character costumes , attributes and ornaments, plants, flowers, fruits, animals, as well as gestures. The symbolism of the paintings is diverse, from fairly simple mythological associations, referring to the antiquity of the family, or vanitative content, popular in protestant Holland, dealing with transience and vanity of earthly life, to more complicated and now almost illegible meanings, requiring knowledge of ancient literature, but also contemporary religious and moralistic literature, very popular in Calvinist Holland.